WaveTester kits offer the fiber optic professional some of the best values in the industry. Whether performing standards-compliant testing, or just simple optical loss tests, there is a WaveTester kit configuration to meet nearly every need. WaveTester kits are now 10-Gigabit Ethernet ready. This new update allows fiber optic professionals to certify their fiber links for 10-Gigabit Ethernet, the next generation of fiber network. WaveTester kits include a WaveTester optical power meter, your choice of light source combinations, a hard-shell carrying case, protective rubber boots, lanyard straps, and free OWL Reporter software and operations guide on CD. 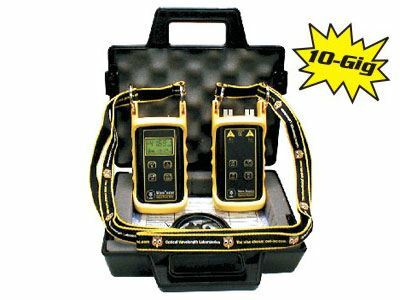 The WaveTester meter comes standard with a small state-of-the-art UNIVERSAL port - fully reliable to allow use of ST, SC, FC or any 2.5 mm patch cables as test cable which saves money on consumables (test cables wear out). Sorry, physics and optics do not allow the same universal connector to work well on any brand of light source. Hence, light sources have fixed ST, SC, or FC connector ports.